Numerous false starts, several uploads, rocky promotion, and now all the posts and videos have been removed. 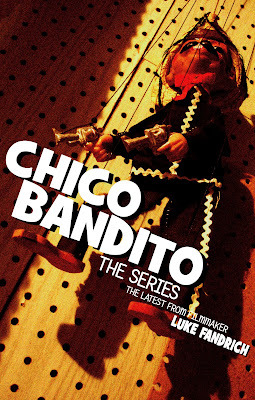 Chico Bandito is a short film series that I started in June 2008 with a single episode. It's a dialogue-free dramedy that focuses on a marrionette named Chico Bandito and his quest for freedom in escaping from a laundry room. It's polished, it's simple, it's charming, and now it's gone - for the moment. With three episodes complete and one in the works, the series has struggled to find views largely because of the delays between installments. Despite 3000 views, my decision to remove the episodes today was inspired by a few things. First of all, with a new widescreen format on youtube I can now upload the videos in their orignal aspect ratios - awesome! Secondly, the scattered release of the episodes has made it difficult to promote the series. I'm going to take some time to seriously look at how to re-release the old episodes, and promote the brand new ones to complete the series. And finally, I can see the potential of the project not only in its style and look, but in the impression the series can make as a complete unit. Because I believe strongly in the concept, and because there was excitment from those who saw Chico Bandito in the beginning, I feel I owe it to myself to take a full step back in order to charge forward. Promotion continues to be one of the biggest struggles. Despite having a strong online presence in multiple online venues, despite taking a very assertive approach to my personal work, despite how hard I push sometimes; it's tough to break into the big numbers to get people to pay attention. A fresh approach with this project feels thrilling, because with a bank of videos waiting to be released I can focus more on promotion and creating momentum. There's a lot to do still, but I'm excited about taking some new steps. For those of you who are interested, and for my sake I hope a couple of you are, the very first episode of Chico Bandito can still be viewed for the time being on Yobi.tv. I uploaded the short to their online film contest, and if you login you can give the short a thumbs up vote to help it gain popularity. At the very least, it's worth a free viewing! See it here. Thanks for reading, and thanks for you help.